- A Mystery Challenge: Create a white Sorcery spell that's 1-mana. - A Mystery Challenge: Create a land with a church, chapel, or castle in the artwork. - A Mystery Challenge: Create a black Beast creature card. It can be more than one color. - A Mystery Challenge: Create a creature with an unearth cost. - A Mystery Challenge: Create a Goblin creature card or a card with Goblin in its name. 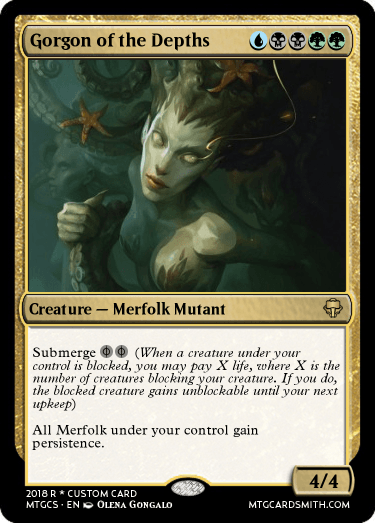 - A Mystery Challenge: Create a Merfolk creature card. - A Mystery Challenge: Create a creature card depicting sasquatch or the abominable snowman. There you go, the abominable snowman. 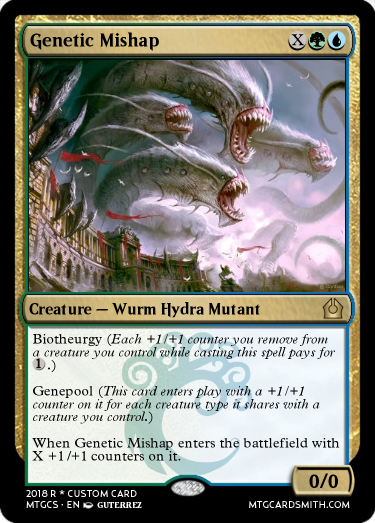 - A Mystery Challenge: Create a card with Venom in its name. Clarification: These cards will not be judged. Any cards from this point on with an unknown artist will be judged as normal. There you go, venemous snake. Another? - An Energy Crystal: To be used on your next box to double the prizes found. - A Mystery Challenge: Create a Dimir card. 15: Ancient Gem: Allows your entry to be an old card. 29: Scrying Goggles: Allows you to see which entry is currently in 1st place and the projected deadline's end. 37: Staff of Banishment: Banish another player from the deadline. 39: Energy Crystal: Double the prize contents in your next box. 58: Carpet Bomb: Destroy all entries with an unknown artist. Also, can I have another box please? - Aryanf's Hugs: 2 hugs + 3 favorites of your choice. A Mystery Challenge: Create a white spell that can destroy a creature. Goblin in the name card! May I have a new box? - The Champions' Pendant: This doubles your winnings should you earn any. Check the comments for further description. Beast card coming up! Another box, if you can be so kind. @jpastor You should probably tag people when you're answering their questions... I didn't see that you had responded until a couple minutes ago. May I have a box? @Fromnono, Staff of Banishment ability. I think I'll pay another visit to the box factory! Deadline has arrived. Any entries from this point on are considered entries for the next deadline. - A Mystery Challenge: Create a white Sorcery that fits in the Khans of Tarkir set. Your Energy Crystal dissolves into nothing. - A Mystery Challenge: Create a green Aura card. - A Mystery Challenge: Create a red spell with "Mana" in its name. - A Mystery Challenge: Create a white creature that creates some kind of creature token. - A Mystery Challenge: Create a spell that has an additional cost to cast it. - An Ancient Gem: This you the option to submit an old card for this challenge instead of a newly created one if you wish. - A Mystery Challenge: Create a rare land that adds only one type of mana to your mana pool. - Favorites: Four favorites of my choice. - A Mystery Challenge: Create an artifact with an activated ability. - A Mystery Challenge: Create a card with crag in its name. - A Mystery Challenge: Create a Spider creature card. 26: The Champions' Pendant: Doubles your winnings should you earn any. @jpastor Can I have another box please? I guess I'll take another too.